Any AQ* that we can get, we'll take for sure. However, up until now, AFAIK, AQD and AQM/AQS were hand-in-hand. If you didn't get one, you don't get the other. Oh yes I agree it probably won’t include AQD I was just responding to why it matters. Either a typo or an inconsistency in first tier of the chart. Two “basic” economy benefits with different rules. OMG >>>>>>>BUY ME THESE TICKETS! I'VE GOT A SINGLE PIN AUDIO JACK!!!! FOR MY HEADSET!!!!!! I can only imagine the meeting at AC, and the thousand hours they put in to identify this as a selling feature. Really. It should go down in the annals of marketing brilliance. So ... no BE on Rouge? AC have top rated entertainment? On which routes? And I guess having in seat power isn’t the same as it working while complimentary hand baggage doesn’t mean it’ll fly with you in the cabin (or even on the same flight). Up until branded fares were introduced, I understood certain perks (AQM, change fees, e-upgrade opportunities) to be tightly linked to the fare class. Now that those perks are much more fluid and my W (Flex) will not equal the next passengers W (Tango), why can't we just ditch most of the branded fare categories and simply increase the number of a la carte add-ons or deductions for every potential perk. When booking a flight, a passenger starts with a base price that either increases as perks are selected or decreases as a passenger elects to forego the ability to change the ticket, earn AQM, etc. If Air Canada really does not want some infrequent flyer to say, pay for a refundable ticket but receive a discount for foregoing AQM, then price those add-ons accordingly. This approach does not do anything for the people who will book basic economy, they should be paying a price they are willing to throw away--e.g. low double digit $$ often offered by Ryanair or EasyJet for advances sales. But why try and squeeze me into four other branded types of fares (tango, flex, flex-lat?, latitude?) Air Canada, when I can tell you what perks I want at time of booking and you will still try and sell me most of the other perks check-in (bag fees, seat selection, LMU)? And I guess having in seat power isn’t the same as it working while complimentary hand baggage doesn’t mean it’ll fly with you in the cabin (or even on the same flight). I'm not a BE fan or apologist, but having witnessed its deployment in the USA last year, AC following Delta's hand baggage approach ("complimentary" hand baggage but most likely no overhead space) is still preferable to AA & UA. Those airlines charge you a checked bag fee, and if you get to the gate, AA charges a penalty too! Why has no airline adopted purchased and assigned overhead bin space akin to a parking stall assigned to a particular apartment? Unlike the storage below the seat in front of the passenger, the bin space need not be exactly where the passenger is. Or has a budget airline done that already? Will status benefits still be exercisable when travelling on these fares? Why has no airline adopted purchased and assigned overhead bin space akin to a parking stall assigned to a particular apartment? I've always wondered the same. I'd pay money for that! i wonder when we gotta start paying for the toilet paper ? Not on the plane, but in many parts of the world you have to pay for it via a fee to get in or you buy it out of the vending machine. these "Basic" fares are a major PITA for anybody booking with an OTA. Good question. For 2018 I would assume yes, but all bets are off for 2019 and beyond. I think this is trying to solve a problem that will be going away. The new MAX aircraft how new fancy bins where the bags can go on their sides. As older aircraft disappear this problem will disapear. 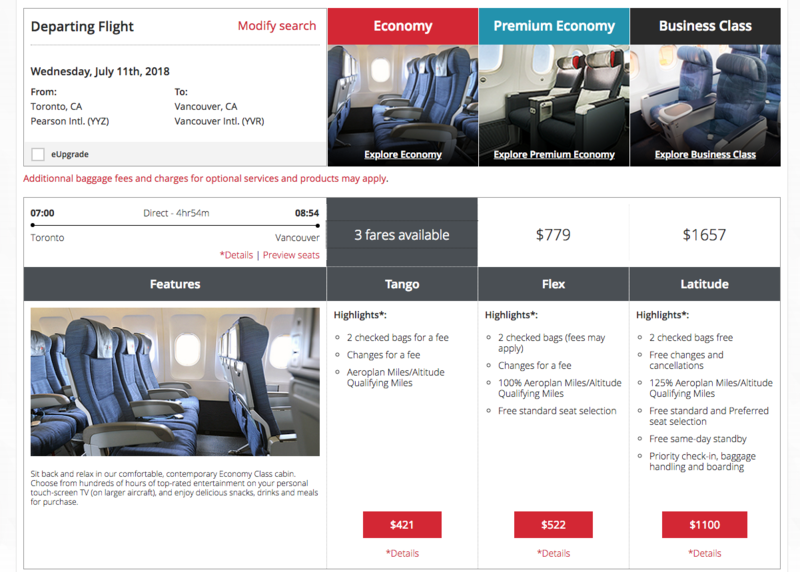 I was also wondering when these fares would launch, but more curious of how this newly designed page would again be newly designed to make room for NoGo Tango. canopus27, Diabeetus, jc94 and 1 others like this. Given the age of ACs fleet I fear we’ll have the E190 and others for many years to come however. But perhaps some hope is good. Another hit at Aeroplan since it will mean fewer miles purchased as low fare travelers opt for this fare. Wonder how the Altitude newsletter will spin it as the likelihood is no elite benefits when flying in this fare, including free checked bag(s) and possibly MLL access! Would appear AC wants to further cull the heard for their its program in 2020 so they can figure out how to prime the pump for elites who will be losing the value of their hundreds of thousands of AE miles yet to be redeemed, and seeing accounts in the new program start at zero? Agree this fare is likely to just appear on routes where the new LCCs fly. AA has Basic Econmy but I’ve yet to come across it when booking routes I fly within the US. Seems to appear on routes where Southwest or other LCCs compete but not on mainline business routes.